The CEM AC2000 Online RTD (Rolling Transaction Display) application features a split screen view of real-time transaction outcomes and alarms on the AC2000 access control system. 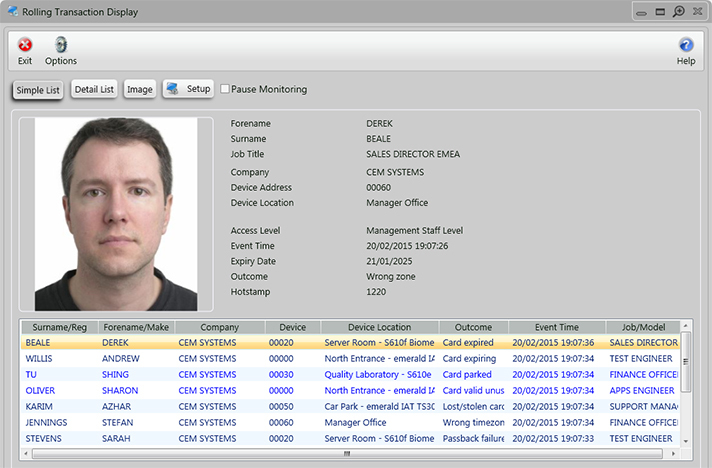 When a card is swiped at a reader, the cardholders stored image and associated personnel details are displayed. This allows security to perform a visual security check that the right person is using the card. The main function of AC2000 RTD is to display real-time photographic and text based information on all cardholder, visitor and vehicle transactions that occur on the AC2000 system. AC2000 RTD features a dual window option, allowing users to display full screen image and transaction outcome in addition to the standard view.